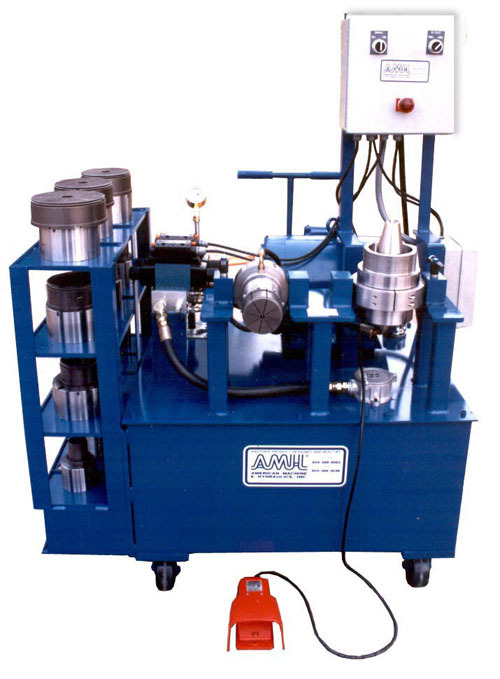 Model 8545 High Production Tube and Pipe Expanding Unit : American Machine and Hydraulics, Inc. The model RCP-8545 is a high production tube and pipe expanding unit. It is motor driven and hydraulic powered. It utilizes a plc unit to activate the form heads. Form cycles are accomplished in 2-3 seconds. This unit has (2) form heads. They form from 1" up to 12". Tool changeover is about 45 seconds. Precise expansion within .003 (.08mm). This unit can expand or bead tube or pipe. Form operations can be made in the vertical or horizontal position. It is portable and mounted on 4 polyurethane casters. A foot pedal activates the form cycle.